So, too, were some the films that arrived three decades ago. From the quirky and underrated All Night Long to the remarkable Cutter and Bone (aka Cutter’s Way) — I recommend J.D.’s excellent celebratory post on Ed Copeland’s blog on what makes it so. However, the arrival of another singular film is what drew me like a magnet to the Colonel’s post. So, in honor of its 30th anniversary, I’m resurrecting and dusting off an old review of mine for director Michael Mann’s inaugural film. a person who steals another person’s property, esp. by stealth and without using force or violence. For a major theatrical motion picture, director Michael Mann could not have asked for a better one in a movie debut. 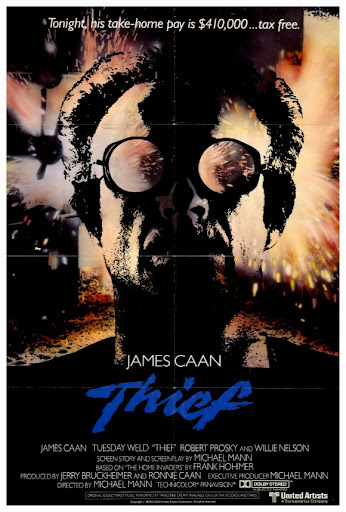 The year was 1981 when he brought us the spellbinding film, Thief, starring James Cann. And, it has always been a favorite of Mann aficionados (include me in that group), and a foretelling of things to come. Not only did this signal the arrival of a talented director-writer-producer, it changed the look, feel, and texture of the crime drama genre from that point forward. And though it’s approaching the 30 year mark, it remains an enthralling examination of a world few had explored as thoroughly as this new filmmaker. The film incorporated a solid cast, with more than one actor making their own screen debuts. It’s a gritty, authentic story – one that has a mesmerizing atmosphere and soundtrack in tune with this director’s now trademark visual style. Though it is now considered the talent pool to draw from for motion pictures, Mann (like another great director, Ridley Scott) did his prerequisite work in TV commercials. Both were the vanguard for today’s directors. However, though Michael’s gift for stunning, even artistic, visuals developed there, it really blossomed once he started directing and producing movies. I include the great TV movie The Jericho Mile here (another film that truly demands a good U.S. Region 1 DVD release – especially if you don’t have access to a region-less disc player). Still, Michael Mann has always been underrated in his ability to tell a story and develop characters. Many of his films were also written for the screen and executive-produced by him. He is in that rarefied air of directors who are also great screenwriters and film producers in their own right. Veteran actor James Caan was in his ‘street’ element when he undertook the role of Frank, the movie title’s high-line, independent thief. And, he’s as hard an individual as the diamonds he steals. The character of Frank is somewhat a throwback to the pantheon of 70’s film anti-heroes. A flawed, dangerous man who draws the audience to him as he attempts to play catch-up from a prison-shortened life. Caan wonderfully portrays him as a man, though expert and skilled in his illegal trade, self-taught and woefully unprepared for any kind of normal (family) life on the outside. His directness (with his collage postcard as a less than adequate roadmap) is one of not wanting to waste any more of the time he has to construct a normalcy he’s never experienced. He’s a nihilist incongruently trying to meld (fulfill) his dreams of a life wished upon him by his prison mentor/father-figure. Unfortunately, Frank’s dreams become his downfall (and another remnant example of a 70’s protagonist). Being state-raised (by the prison system) and with little to no parenting to bolster himself on, Frank’s nature is gravitationally pulled toward father-figures. Easily, the other stirring character performances in the film are from them: the too-little seen Willie Nelson as Okla, and especially, Robert Prosky as the displacing entity, Leo. In a remarkable screen debut, Prosky is startling as the syndicate leader seeking to tempt Frank with a Faustian deal. His paternal stalking and entrapment of Frank (and the audience) is hypnotic. And when it’s realized, he gives one of the most chilling and vile culminating speeches spoken on film, ever (and all of this by a sweet looking old man, at that). The other very touching performance is by Tuesday Weld as Frank’s love interest, Jessie. Hers is one that makes Frank’s decisions late in the film that much more heartbreaking. The supporting cast members are more than solid, with Jim Belushi (in his first prominent role), retired cop Dennis Farina, and John Santucci (in another debut) standing out in their minor roles. For those who’ve yet to have seen one, if there’s another earmark of a Michael Mann film, it is in its authenticity of story and trade craft. The basis for the story is the 1975 book, The Home Invaders, by Frank Hohimer. Thief also makes use of real-life thieves as technical advisors (and as cast members). In fact, real-life Chicago cops also dot the cast and lend their experience in the proceedings (and makes one wonder what it was like with that mix on those sets and shooting locations). The terms and dialogue, tools and techniques used in the film ring true because they are (and director Mann wouldn’t have it any other way). The safes dissected up on the screen are real, too (no props here). All of the tools and guns are genuine (and have real histories). Another point is the combat pistol craft on display, especially by Caan’s Frank character. Nothing here is Hollywood fake or flash. All of this adds to the undisputed credibility in the film and only enhances the direction and actor’s performances. Michael Mann created a memorable major film and directorial debut that’s brimming with visuals and technique that would be copied throughout the 80’s by others. But, besides its style and atmosphere, it’s a more character-driven movie than many give it credit. And, as Amazon’s Jim Gay writes, beautifully photographed by Donald Thorin and enhanced by the Tangerine Dream soundtrack. This DVD is the director’s cut, not the theatrical version shown on screens in ’81. It has some minor scene additions to the theatrical release. I’m also in complete agreement with other reviewers and bloggers that this was the precursor to Mann’s more realized film, 1995’s Heat. In fact, if you listen to the very informative and fun commentary track by Mann and James Caan (which was probably done for the earlier laserdisc release of the film), you’ll learn it was recorded while the director was filming that later, great work. They are both worthy and remarkable films for each of their decades, and their fans (like me). As always, Michael, you leave me with nothing to add. Great post. Do we still have character actors like Prosky anymore? And is there anyone who commands my attention on screen as instantly as Dennis Farina always does? I think there are still some great character actors like Prosky (or Farina) out there, but they are buried today under the celebrities and big budget remakes the studios keep heaping on us. I point you to the likes of John Hawkes in last year’s Winter’s Bone as an example of a performance and film that should have been seen by more folks. Thanks so much for you kind words, Naomi. Awesome review and thanks for the shout-out, my friend. I am in total agreement with your assessment of THIEF. Such a great film and, as you point out, a harbringer of things to come with Mann. He was just getting warmed up and wow, does this film just ooze authenticity with the way the safe-cracking scenes are done to the way the cops talk. I also love the locations – you really get a feeling for Chicago in the way the film is shot and the locales Mann picks. Great stuff. Thank you very much, J.D. Thief, even after all these years, remains a mesmerizing tale. It’s one of the great films where the city of Chicago is a prime character in the film. Thanks again for the shout out, I am a big Thief fan as well, as self assured of a debut theatrical film as any in the decade, with the thematic quest for independence that would show up in nearly all of Mann’s work in one way or another. Wonderful review of a wonderful, and underrated, film. I hear you, Colonel. Mann burst from the gate with a self-assurance, and the talent to back it up. Thanks very much. Great review, I love this movie. The casting, the screenplay, the cinematography, and the score were all pitch-perfect. Robert Prosky was incredible as Leo. He did another excellent turn as a villain three years later in THE NATURAL. He was an outstanding character actor. Oh, yeah! Prosky was excellent in The Natural. Good one, John. Thanks for your comment. Oh, wow! This just went to the top of my queue. I love safe-cracking and I love Chicago. I can’t wait to see this one! Off-topic 1: I forgot to tell you that I watched THE FOG and I loved it! What a film. Next up – STARMAN. Off-topic 2: People snicker at me when I verbalize my laser disc memories. I realize for several reasons (the brevity of laser disc, my age, the socioeconomic background of my family) it’s odd that I have laser disc memories but I just love that short movie-watching time span of my youth. Shoving those behemoth things into my grandma’s player was at least half the fun. 🙂 It’s not like they are reaching the glorious memories of vinyl but there is still a special place in my heart for the laser disc. I’d really be interested in hearing about your experience with this one, Rachel. And it’s one I’m anxiously awaiting to appear on Blu-ray Disc. Off-topic 1: I forgot you were still doing that John Carpenter set. Cool! Off-topic 2: That’s great to hear! I never had a laser disc player, but did watch a couple of films over at my wife’s friend’s home years ago. In fact, the first time I saw the director’s cut for Aliens was on laser disc. I just saw this from your rotating marquee, Michael. It’s one of the three Michael Mann’s feature films I haven’t seen. Hope to rectify that at some point. Let me know what you think after you’ve screened it :-).